Home >> A Books >> EW's Best of the Bug Books! What would our world be like without bugs? Life would be much different, that's for sure! Without insects, fruits and vegetables wouldn't grow. And many species that depend on insects as a food source wouldn't exist. Insects may be tiny in size, but in population they outnumber humans. If you placed all the humans in the world on one scale and all the insects on another, the insects would outweigh the humans! Gather all the books written about insects and you could fill many school library shelves! Few topics are of such interest to students as insects are. Each year, dozens of new books are published on the subject. This week, Halloween week, is an ideal time to take a look at some of the most interesting new "bug books"! 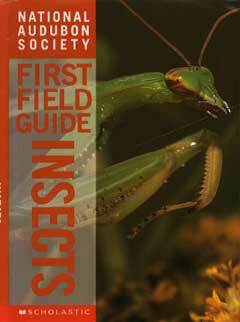 Now Scholastic adds Insects to its series of field guides for children ages 8-18. Insects joins field guides (created in partnership with the www.audubon.org National Audubon Society) devoted to Rocks and Minerals, Birds, and Wildflowers. Each guide is designed to fit in the pocket of a field vest, to be used as a handy reference for identifying nature in its natural surroundings. The newest of the guides --the one focused on six-legged creatures and spiders -- offers easy-to-read text, more than 450 color photos and illustrations, a waterproof card with postage-stamp-sized images of 50 of the most common insects, and much more! The real beauty of Insects lies in its simplicity! The guide includes 50 photo spreads. Each spread includes a large photo of a perfect insect specimen, some fast facts about the featured creature, a handful of comments about "what to look for," and information about the insect's size, habitat, and range. Doesn't get much more simple or clear than that! In addition, each spread includes two or three more photos of creatures with which the insect might be confused or with which it might share common features. The world of insects -- tells you about how naturalists learn about insects, how long insects have existed, how insects and spiders differ, and how insects are named. How to look at insects -- provides information needed to begin identifying insects in the field, fascinating facts about the 12 groups of insects you are most likely to see, explanations of the life cycles of insects, and descriptions of the plights of several rare and endangered species. A handy reference section -- includes a helpful glossary of technical terms used by entomologists and naturalists; lists of useful books, organizations, videotapes, software, and Web sites; and an index of species covered in the field guide. The National Audubon Society First Field Guide: Insects is the perfect first field guide for children -- and for adults! Looking for a fun -- not frightening -- way to introduce primary-grade students to the world of spiders? 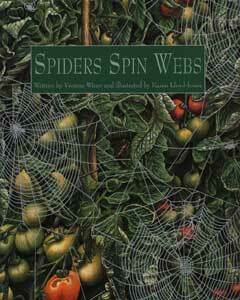 Spiders Spin Webs (Charlesbridge Publishing, 1998) offers a basic "field guide" to a wide variety of spiders. This spider guide's rhyming text (by Yvonne Winer) and realistic illustrations (by Karen Lloyd-Jones) is a decidedly un-creepy intro to the eight-legged creatures. On the right-hand side of each spread in Spiders Spin Webs Lloyd-Jones provides a stunning full-page illustration of a spider in its natural habitat. The scenes -- depicting spider life in all seasons of the year and in all habitats, from underwater to the bough of a cactus plant -- furnish insight about many spider habitats and the many forms that spider webs take. On the left-hand side of each spread, an up-close look (uncluttered by its natural surroundings) at the spider accompanies Winer's rhyme. The first few rhymes in Spiders Spin Webs answer the question How do spiders spin webs? Subsequent rhymes tackle the when, where, and why of web-dome. The rhymes are simple. They offer basic information and vocabulary, and they set the mood for Lloyd-Jones's realistic watercolors. If it's more specific or "sciency" information about spiders that students yearn for, Winer offers in the back of the book a Spider Identification Guide with facts about each spider. Janice Van Cleave has a book of activities and experiments for almost every science topic of interest to students. So, naturally, she has created Janice Van Cleave's Insects and Spiders (John Wiley & Sons, Inc., 1998). Subtitled "Mind-Boggling Experiments You Can Turn Into Science Fair Projects," Insects and Spiders provides activities for students of all ages. * Cut off the top 4 inches of the soda bottle. *Place half of an over-ripe banana in the bottom part of the bottle. * Insert the top part of the bottle backward into the bottom part. * Lay the bug catcher on its side on the soil for 6 to 8 hours. * Use a field guide to identify the insects that enter the bug catcher. Throughout Insects and Spiders, Van Cleave is attentive to issues of conservation (be sure to release the bugs caught in your bug catcher after you've used a magnifying glass to identify them and drawn a picture of them for your observation log) and safety. Among the other activity ideas: Use a toilet paper tube and a handful of straws to create a model of a grasshopper's eye. And create a simple insect-attracting food solution from sugar and water and place samples of the solution in plastic dishes on papers of different colors. Record your observations. Are insects attracted to some colors more than to others? Van Cleave's latest book also provides a glossary of insect terms and lists of field guides, insect-related literature, and supply houses (from which you can order bugs!). 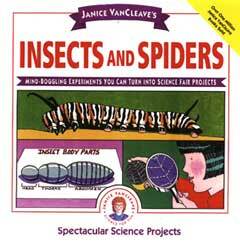 Use Janice Van Cleave's Insects and Spiders to liven up any study of insects and spiders. (And check out her other titles. She's bound to have a book related to every area of your science curriculum!) All of Van Cleave's activities and experiments use inexpensive household materials and involve a minimum of preparation and cleanup. 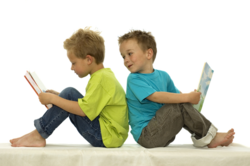 Looking for a great introductory resource for your K-4 students? 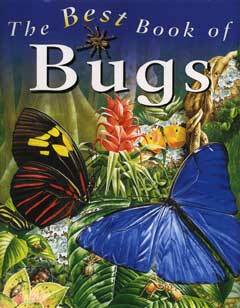 The Best Book of Bugs (Kingfisher, 1998) covers all the bug basics. Students will travel to a host of habitats as they discover the bugs around them, above them, and beneath their feet! Among the topics explored are Spinning Spiders, Buzzing Bees, Busy Beetles, and Darting Dragonflies. Eye-catching illustrations provide students with a bugs-eye view of insect life near the pond, in an ant colony, and inside a beehive. Simple text and captions provide the bug basics. In addition, a handful of sections explore in-depth different aspects of the world of insects. For example, follow the stages of a "honeybee's year," learn about the different jobs of ants in a colony, or learn how a dragon fly nymph captures a targeted tadpole or how a full-fledged dragonfly uses it two sets of wings to twist, turn, and hover. All the creepiness of the bug world is gone, all the fascinating information remains intact, in The Best Book of Bugs. Have You Seen Bugs? 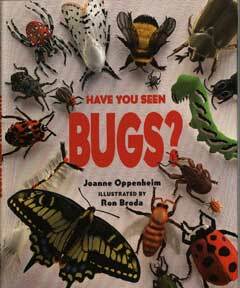 (Scholastic Press, 1998) is the newest book from author Joanne F. Oppenheim (Have You Seen Birds? and Have You Seen Trees?). "Itty-bitty bugs small as specks of sand, wide-winged bugs bigger than your hand. Bugs with stripes or speckles or spots, shiny like metal or covered with dots." Rhyme after rhyme provides the perfect introduction for primary-aged students to the wide world of "bugs that flutter and scurry and dive, bugs that buzz around a hive." Through Oppenheim's rhymes we learn lots of facts about the variety of bugs, their habits and habitats, and the work they do. The rhymes, and Ron Broda's accompanying three-dimensional paper sculptures, reflect a passion for the world of insects. The vivid words and illustrations bring bugs alive for students young and old! The last page of Have You Seen Bugs? provides an index of insects in each of Broda's illustrations and one more rhyme from Oppenheim that offers additional information "About Bugs." The last of our bug books is a huge departure from the rest. 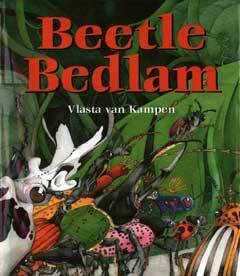 Author/illustrator Vlasta van Kampen sets Beetle Bedlam (Charlesbridge Publishing, 1997) in an insect courtroom. At stake here is the life and reputation of bark beetle, charged with the murder of the forest's trees. "Tree killer! Forest wrecker!" shouts the angry crowd, about ready to lynch bark beetle. "...[T]hat awful little bug, who's he? I just concentrate on being beautiful. See those tiny creatures on my back? I hire them to catch body mites and keep me clean." "Enough!" snarled Goliath. "Dismiss the witness -- and don't get her dirty." The hilarity mounts to a climax as dung beetle rolls a dung ball into the courtroom. A little bathroom humor is one way to get to reader, I guess! Vlasta van Kampen's illustrations are a clutter of insect legs and antennae, not always a pretty sight, but they help to convey the confusion of the courtroom. Young students might play a Where's Waldo-like game, as they hunt for each insect character in the illustrations. I think students in grades 2 and up would love take on van Klampen's distinct (or distinked, in the case of the dung beetle) characters as they act out Beetle Bedlam. Let your strongest actor portray the grouchy Goliath beetle!